Originated by W.F. Homeyer Jr., of Macon, Georgia, USA. Registered (1986) under the name 'Dahlohnega', but also known as 'Golden Anniversary' and so often given to celebrate a Golden Wedding anniversary. The medium-sized, formal double flowers can vary from a creamy-white to a pale yellow, and being late flowering (April into May) are often unaffected by frosts. The plant habit is upright, bushy and compact, with dark green, glossy leaves, and is fairly slow growing - a 10 year old plant would probably be no more than about 4ft (120cm) high. An excellent specimen plant for growing in a container or small garden. Excellent service, delivered promptly to Jersey in time for my parents' golden wedding anniversary. Beautiful specimens, arrived undamaged and in great shape. I couldn't purchase these locally so was delighted Trehane could supply. Highly recommended! Plant arrived extremely well packaged, looking glossy and healthy. I dont know much about camellias, but it is a present that I'm sure will be much appreciated. Swift service with tracked delivery. Thank you. Arrived in plenty of time for anniversary. Well packaged and a very good plant. Excellent service and will use you again. Thank you. 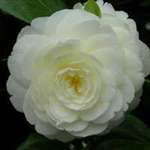 The Camelia is an excellent quality plant and a good size. I was worried about ordering a plant from the Internet as it is intended as a gift but the packing was superb, very robust and delivered on time. The camellia arrived in perfect condition. Very healthy shrub, well packed,quick delivery and good communication. Thank you.